ok, we (as in I) have fallen in love with making rope baskets. There is something fulfilling about taking something utilitarian (the rope) and creating a beautiful and useful basket. However, you know you’ve crossed a line when you “demand” that the kids take the new rope harvest basket out to collect eggs instead of the plastic pail they’ve been using. And you get your feelings hurt when your husband doesn’t understand why it’s such a big deal. Not that this happened to me. I’m just saying that if it happens at your house, you’ll know you’ve crossed a line. Let me introduce you to the object of all this fuss…The Harvest Basket. They say the best ideas come to you in the shower, and well, this one literally did. I could not stop thinking about how to make a basket with one handle that wouldn’t tip over while being carried. And then it hit me, make two handles and put them together with leather. I had no clue how to do that but I do have a house full of Boy Scouts so surely someone would know to wrap the handle of my rope baskets with leather. So for the last week, I’ve been pulling out my machine to practice making all kinds of different baskets, but the harvest basket is my favorite. I’ve made so many that I’ve been giving them to my gardening friends and still have a desire to make more. 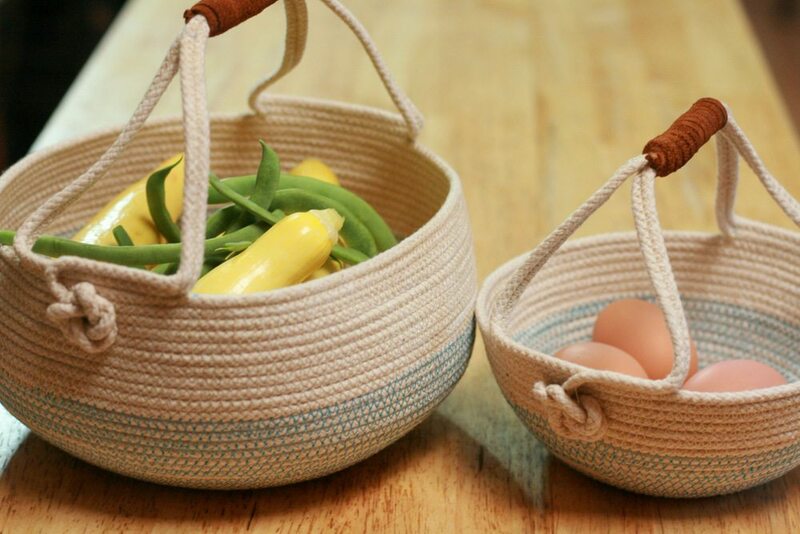 I’ve found multiple uses for rope baskets and burlap and canvas baskets in my home. I use them in the living room, kitchen, bedrooms, even the bathroom to hold hand towels. These are so much cheaper to make than buying a basket or storage container from the store and are great for gathering those little piles of things that tend to gather that no one really knows what to do with but we can’t get rid of. All you need to make a rope basket is rope, a sewing machine that has a zigzag stitch, and thread. I really appreciated this video and it’s well worth the small price or you can sign up for a free 14 day account. That was my first step and that’s what I would recommend you do if you are new to rope basket making. Here are some other tips to help you out. Remember this is supposed to be fun. It will take a little time to get your hand placement just right for you to make the basket you want. Some of my beginning baskets have waves in them. It’s okay, it adds character and it’s how people will know it’s handmade. If you are making an oval, make sure to keep the ends tight. Each time you go around the curve is an opportunity for the rope to loosen a little. My first oval looked like a dog bone by the time I was done with the foundation. Practice with natural colored thread. Don’t worry, you’ll still see your mistakes. They just won’t be as visible to everyone else. Go slow and pay attention. After doing a couple of baskets really good, I got too sure of myself and the next few had gaps and were uneven because I was going too fast. Don’t let the simplicity fool you. Use a jeans or leather needle. Needles matter and there’s a reason they make a variety of them. I find I get better results when I use a jean or leather needle when making rope baskets then when I use an all purpose needle. Edited to add:: if you are having trouble finding rope, this is the one I use. The main thing for the rope is that you don’t want the core to be synthetic. The needle will get hot while you sew and melt the plastic. There is a way to make no sew rope baskets but I don’t think it’s really any easier. However, if I want to use 1/2″ or larger rope to make a basket, then a no sew rope basket is what I make. 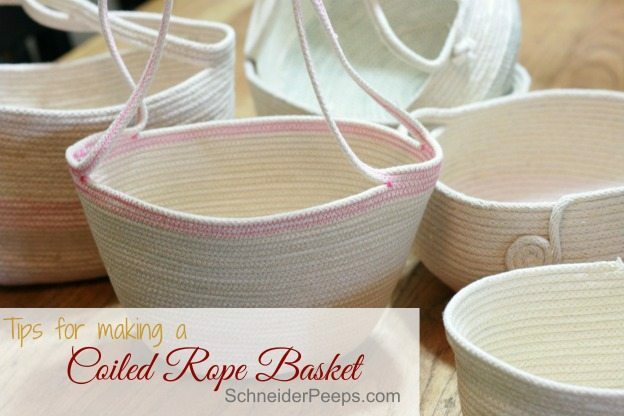 To make a no sew rope basket you’ll need a glue gun and glue sticks, rope, and something to help form it. Find a suitable form. The form can be a small round waste basket, a large coffee can, really anything that is sturdy and the size you want the basket. Have plenty of glue sticks. I promise, you’ll go through more hot glue than you think you will. Use parchment paper or waxed paper to cover the form to protect is from the hot glue. When the basket is as large as you want it to be, just slip it off the form. If any paper is sticking to it, remove the paper. Secure the end so it doesn’t fray. The end of the cotton rope will eventually fray, so be sure to either coil it, tie it in a not, or glue it down so it doesn’t fray. 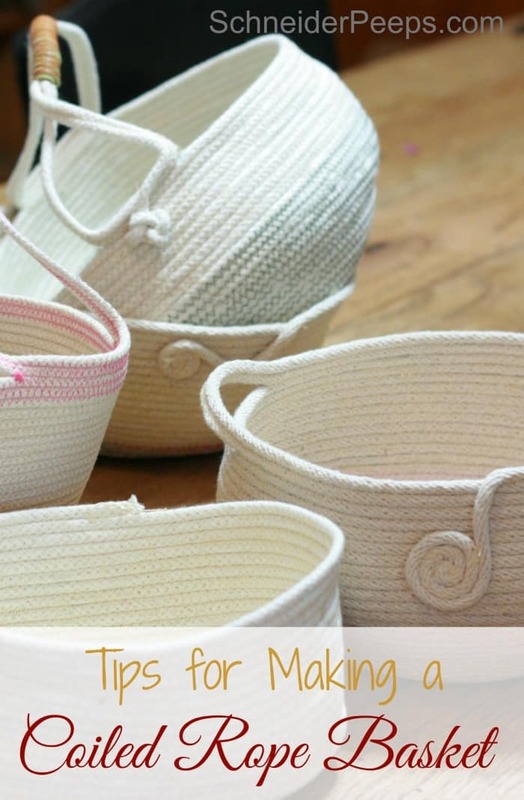 Use the no sew rope basket method to make cute planters. I like to cover a tall spaghetti sauce can with coiled rope to make planters. Find a small garden pot that will fit inside the can and plant the plant in that, then just set the pot in the rope coiled planter. I have been trying to find 1/4″ coil core in Canada…. do you know of anyone. I find only 2 places in US but the dollar and delivery make it too expensive for me…. Hi Judi, the rope I use is Secure Line (product number CCL6100-4W) it’s distributed by a Canadian company, Atlas Rope (http://www.atlasropes.com/). I have to order by the case but there are only 4 – 100ft spools per case and they don’t charge me shipping. You might try calling them, their number is on their website. Hope that helps. These are beautiful! I love the colors, and the way you did the handles!! I’ve got to try making a few of these – I’ll add it to my ever growing list of crafts LOL. Why can’t anything be free any more? I’m confused by your comment Tammy. Are you referring to the video ($5) that I linked to because all the information I share on my blog is FREE. I guess I could have spent my time doing my own video and sharing it but I can guarantee you it wouldn’t be as good. I’m sure you can do a google search and find a video, the one I linked to just happens to be the one I watched, so that would be the one I shared. I meant the $5 for the video not for you. Okay. I don’t understand. I just looked and I can watch the $5 video for free if I sign up for the 10 day free trial on Creative Bug. Why would anyone complain that you linked to a paid service, when they can watch for free signing up for the trial period. It seems like a really awesome service, too. Thanks for the referral. I didn’t know about Creative Bug and it looks as awesome as Craftsy. I can see many hours being taken up with searching their site for more inspiration. And your baskets are amazing. My pine needle baskets take days to make, literally days. I didn’t know you could make a basket in just an hour. I’m definitely going to try this. 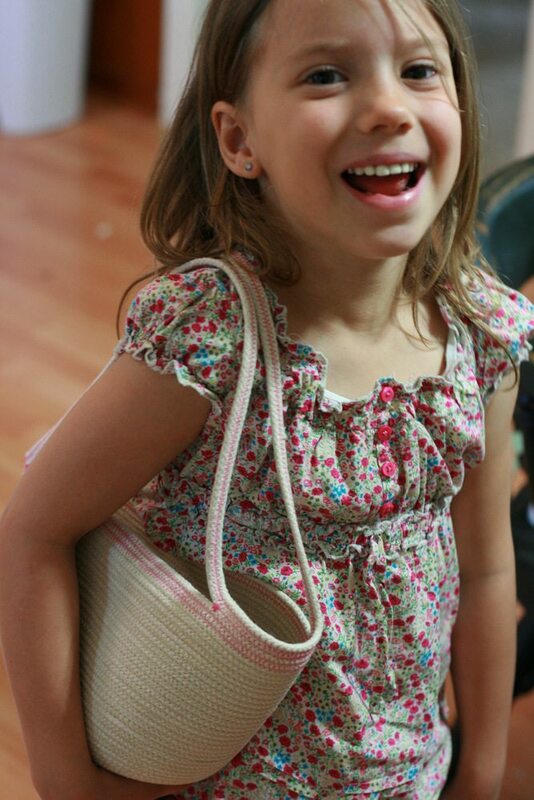 I also love your daughter’s purse. This would make a super nice market bag for the farmer’s market, too. I missed that Chris, thanks for pointing that out. I’m really liking Creative Bug and yeah, it’s a lot like Craftsy. Do you have photos of your baskets on your site? I’d love to see them. Sometimes we need to sit back and think a moment about how much time and energy goes into creative art….which would include making a video “how to” as well as the result of the creation. Creative people need to eat too. $5 for their time and effort is very little to pay for a craft that may end up giving countless hours of joy as well as possible income if you decide to sell your finished project. Free is wonderful, I agree. It’s just not always practical. Being a Longarm Quilter, I agree with Pam about creative people needing to be paid for their time and effort. Most people don’t mind paying for quality information/instruction. I love your bags and hope to make some at a sister’s weekend coming up. Thanks, I hope you have fun at your sister’s weekend. Sounds like fun! Your quilting is beautiful! I have a couple of quilt tops that I started before I had my youngest child and just haven’t found time to finish them. This technique is ancient, just not all using a machine. You can find this technique in library books, podcasts and YouTube videos. Wonderful post! I love these baskets and the great information! Thanks so much! Thanks. I can’t wait to see the ones you make! Your last post gave me the bug so I’ve watched the video and am setting aside money to buy some rope. I’m so excited. They look so lovely and functional. My grandmother gave me the basket bug. My kids gave me baskets of various sized last year for Christmas. I just might have to buy one from your Etsy shop so I’ll have a “guide” 🙂 Thanks so much for such a wonderful craft – I’m not crafty At All, but I do like to sew a little and I think I can do this. It’s 22.51 and I want to make one now! Your baskets are super cute and whimsical. Do you have a favorite place you like to purchase your rope from? What size do you like to work with. They look like a fun project! Hi Mo, I just get 3/16″ cotton rope from my local Walmart. It’s similar to this one, http://amzn.to/1SxRioB, but I like the recreations on with the red label instead of this clothesline one with the green label better. The clothesline one has plastic inside and is harder to sew through than the recreation one. Let me know how yours turn out! I hope it becomes your obsession too, the world cannot have to many rope baskets. Nylon is going to be tough. I bought some cotton rope that has a synthetic core and it caused my machine to skip stitches. The needle would get hot and melt the core and then I had goop on the needle. I’m not sure what the exchange rate is so I don’t know how much that is, but if it’s not too expensive you might want to try it. If it doesn’t work you’ll have some nylon rope for something else. If you make some baskets be sure to share a photo with me. You are a wise woman, Linda! I plan to make some coiled bowls for my family for Christmas this year. How do you secure the extra little coil on the outside of the basket? I assume you made this at the end of your line to finish it off. It looks so good but I’m trying to figure out if you had to hand sew it on or did you use hot glue? Thanks! Hi Debbie, I hand sewed that part. You could use hot glue, but I didn’t think of that. I’d love to see your bowls when they’re done. If you’re on fb feel free to post them on my page. http://facebook.com/schneiderpeeps Have fun!! Hi, I love your baskets. I went to Walmart and got Workchoice Diamond Braid Clothesline. When I got home I noticed a warning on the label saying that this product contains materials that cause cancer and birth defects. Do you have any idea what this means? Wondering if there is something that is on the surface and I shouldn’t handle it much. Have you seen this before? Does the clothesline wrap from Amazon actually a silver color other than a natural one. You posted this link. You also mentioned a red tag better than green with sewing. The item number in the link you mentioned is the same item number I use. Our Walmart no longer carries this brand either so maybe they all stopped carrying it. I’ll update the article. Why is my bowl floppy and woundn’t sew inward at top. I followed Nicole. Creative bug. Would like instructions on how to make the Harvest Basket. Are they available? Hi Shirley, I don’t have written instructions on how to make the harvest baskets. However, I can give you some general guidelines. Make a basket as big as you want it and don’t cut the rope off. Then add handles by measuring a length of rope that looks like it will a good length for the handle. Then attach it on the opposite side of the basket and then stitch the rope a few inches to the basket. This is one handle. Do the same on the other side for the second handle. When both handles are done, bring them together and wrap them with leather or stitch them together. Hope this helps. It really just takes a little playing around with various shapes, sizes, and handles to figure out how to get what you want.